**Winner of the Tripadvisor Certificate of Excellence 2014** The Royal Oasis Club at Pueblo Quinta is located in the much-coveted location of Benalmadena on the Costa del Sol. Here guests will be able to relax and absorb the fantastically sophisticated.. Enjoying a privileged location in the heart of Costa del Sol, this fantastic holiday resort is located right on the boardwalk and within walking distance from the beach, offering an ideal base to enjoy a relaxing and sunny holiday. The establishment is.. The apartment hotel is surrounded by beautiful green gardens and is situated right opposite the Malaga's Renfe train station. The beach is around 1 km away. 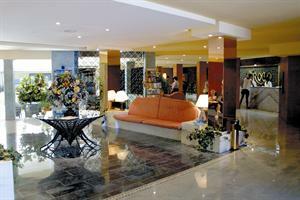 This lovely three-star hotel set in the heart of Costa Del Sol offers 24-hour reception and check-out.. The Holiday Palace Aparthotel forms part of the impressive Holiday World Resort located between Fuengirola and Benalmadena, 300 metres from the main entrance to the beach. The Holiday Palace is close to Caravaial Beach and less than a mile from the resort.. The Apartamentos Vistamar are situated as their Spanish title suggests; overlooking the sea. The nearest beach is located only 400m from the hotel¿s front doors and can be reached on foot in approximately six minutes. This beachfront is an excellent.. Located just 20 minutes from Malaga International Airport, this attractive hotel is within easy walking distance of both Benalmadenas sandy beach and the city centre. Guests can enjoy a game of golf at one of many local courses, set out to explore the.. 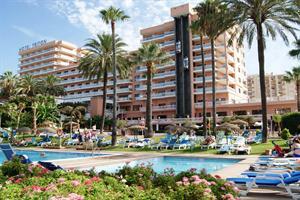 The Hotel Best Benalmadena is ideally located in front of the beach. The hotel features an impressive range of on-site facilities to ensure an unforgettable stay for all who visit. Outside, the open-air swimming pool is surrounded by terraces, making.. The Hotel Best Benalmadena is situated in the quiet village of Benalmadena Costa, just on the sea line and not far from golf courses.ServicesCafeteria and snack bar. **It is obligatory wear formal dress (long pants) at dinner Restaurant**Buffet style.. The BEST SIROCO is situated in a bustling location, where visitors can enjoy a whole range of tourist activities. Of particular note are the panoramic views of the garden and of the swimming pool. It's406 rooms offer customers a functional and pleasant.. This 4**** hotel attracts visitors who have been seduced by the charms of the coast. Of particular note are the panoramic views of the swimming pool. Its 373rooms are spaces where guests will find the comfort and peace they require to rest. Advice to..